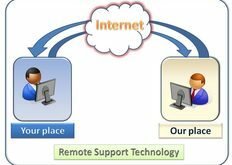 Remote Log-In support can be performed at a time that is convenient for you & your business. Remote login service will be billed for at a ½ minimum of $43.00. Then billed in 15-minute blocks at $21.50 after the first ½ hour. ​$86.00 fixing most malware& spyware issues along with detailed system cleaning and speed issues. Remote Login Service is PC SAR’s Preferred technique for providing service. There are many advantages to remote login. It’s the quickest and most affordable, less downtime, quicker repair time and no disconnecting from your computer. With remote login, repairs & services can be performed, not only on your computer but also on printers, scanners, and any other devices you have connected to your computer. If you can access and can log on to the internet PC SAR 911 can remote login with you. And often this will be our first step and suggestion when it comes to helping you with your computer. On-site and in-shop services are billed at a flat rate of $86.00 plus parts if needed. PC SAR will always let you know in advance if there will be any additional charges.